2018: Solo Show #7 “Lit” (October) at the Ian Tan Gallery in Vancouver. 2018: Summer Group Show (June - Aug. 31) at the Ian Tan Gallery in Vancouver. 2018: Spring Group Show (March 3 - 30) at the Ian Tan Gallery in Vancouver. 2017: Winter Group Show (December 1 - 24) at the Ian Tan Gallery in Vancouver. 2017: Painting donated to Out in Schools' "Fall Gala 2017". 2017: Summer Group Show (July 3 - 31) at the Ian Tan Gallery in Vancouver. 2017: Painting donated to A Loving Spoonful's "Project Empty Bowl 2017". 2017: Spring Group Show (March 25 - April 30) at the Ian Tan Gallery in Vancouver. 2016: Summer Group Show (July 2 - 31) at the Ian Tan Gallery in Vancouver. 2016: Spring Group Show (March 1 - April 7) at the Ian Tan Gallery in Vancouver. 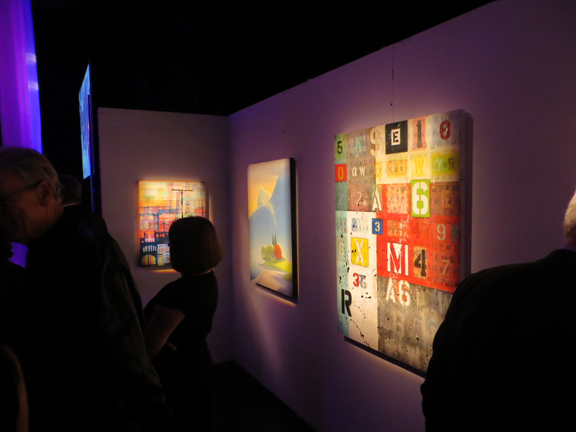 2015: Winter Rotating Group Show & "Deck the Walls" event (Dec. - Jan.) at the Ian Tan Gallery in Vancouver. 2015: Summer Rotating Group Show (June 1 - Aug. 31) at the Ian Tan Gallery in Vancouver. 2015: Spring Group Show (April 1 - May 31) at the Ian Tan Gallery in Vancouver. 2015: Curated the "Into the Mystic Art Exhibition" (March 3 - April 14) for Semiahmoo Arts in the Turnbull Gallery in South Surrey, Canada. 2015: Gallery Artists Group Show (Feb. 1 - 28) at the Ian Tan Gallery in Vancouver. 2015: Winter Group Show (Jan. 5 - 31) at the Ian Tan Gallery in Vancouver. 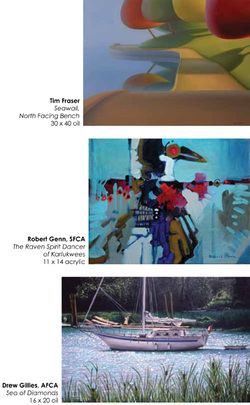 2014: Curated the "2014 Members Exhibition" (Dec. 2 - Jan. 5) for Semiahmoo Arts in the Turnbull Gallery in South Surrey, Canada. 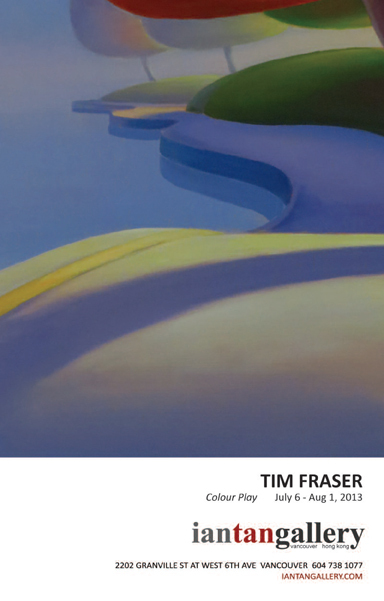 2014: Summer Group Show (July 1 - August 31) at the Ian Tan Gallery in Vancouver. 2014: Group Show (May 1 - June 30) at the Ian Tan Gallery in Vancouver. 2014: Co-Curated the "PEPA'KEN" Exhibition (May & June) for Semiahmoo Arts in the Turnbull Gallery in South Surrey, Canada. 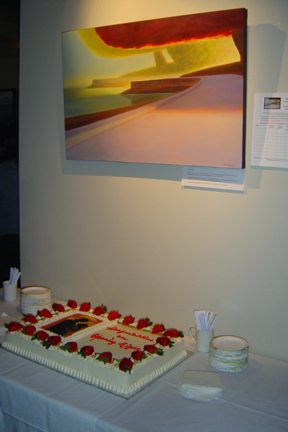 2014: Curated the 2014 "Richard Tetrault & Mural Artists" Exhibition (May) for Semiahmoo Arts in White Rock, Canada. 2014: Spring Group Show (March 1 - 30) at the Ian Tan Gallery in Vancouver. 2014: Curated the 2014 "Art O' the Green" Exhibition (March) for Semiahmoo Arts in White Rock, Canada. 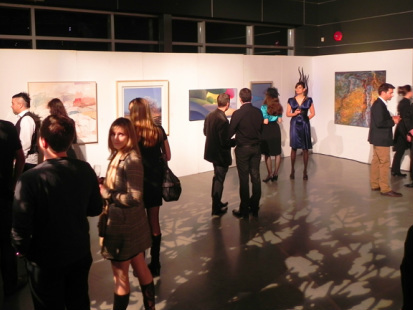 2014: Curated the 2014 "Expressions Festival" Exhibition for Surrey locations of Arts Umbrella in Surrey, Canada. 2013: Curated the 2013 "Members" Exhibition (December) for Semiahmoo Arts in White Rock, Canada. 2013: Taught workshop "Suggesting Light with Paint" at Art Farm 2013 (August), to raise funds for the Fort Gallery in Fort Langley, Canada. 2013: Solo Show #6 “Colour Play” (July) at the Ian Tan Gallery in Vancouver. 2013: Curated the 2013 "Expressions Festival" show for Surrey locations of Arts Umbrella in Surrey, Canada. 2013: Curated the "Auld Acquaintance II" show for past members of the Fort Gallery in Fort Langley, Canada. 2012-2014: Visual Arts Technician (part-time) for the Surrey locations of Arts Umbrella in Surrey, Canada. 2012: Winter Group Show (Dec. 1 - 23) at the Ian Tan Gallery in Vancouver. 2012: Painting donated to the “Art for Life” fundraiser. 2012: Summer Group Show (July 25 - August 22) at the Ian Tan Gallery in Hong Kong. 2012: Summer Group Show (July 7 - August 30) at the Ian Tan Gallery in Vancouver. 2012: Part of the Ian Tan Gallery booth at the San Francisco Fine Art Fair, May 17 - 20. 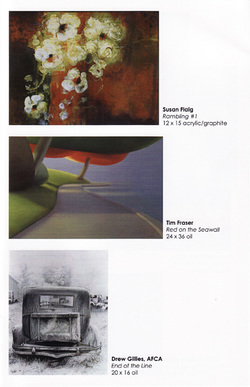 2012: Spring Group Show (April 14 - 26) at the Ian Tan Gallery in Vancouver. 2012: Winter Group Show (Jan 3 - Feb 29) at the Ian Tan Gallery in Vancouver. 2012: Curated the "Auld Acquaintance" show for past members of the Fort Gallery in Fort Langley, Canada. 2011-2013: Manager (part-time) of the contemporary artist run Fort Gallery in Fort Langley, Canada. 2011: Painting accepted for the Federation of Canadian Artists exhibition “Small, Smaller, and Smallest”. 2011: Painting donated to the “Art for Life” fundraiser. 2011: Painting donated to the Federation of Canadian Artists fundraiser “Paintings, by numbers”. 2011: Solo Show #5 “Colour Composed” (September) at the Ian Tan Gallery in Vancouver. 2011: Represented by Gallery 223 in Nanaimo. 2011: Spring Group Show at the Ian Tan Gallery in Vancouver. 2011: Painting accepted for the Federation of Canadian Artists exhibition “Landscapes”. 2011: Painting accepted for the Federation of Canadian Artists exhibition “Human Figure”. 2010: Painting donated to the Federation of Canadian Artists fundraiser “Paintings, by numbers”. 2010: Two man show (July) with artist Will Rafuse at the Ian Tan Gallery in Vancouver. the Canadian Cystic Fibrosis Foundation. 2009: Panel contributed to Mural Mosaic’s “Kunamokst” mural for the Galiano Inn. 2009: Solo show #4 “Path into Colour” (September) at the Ian Tan Gallery in Vancouver. 2009: Painting donated to the Federation of Canadian Artists fundraiser “Paintings, by numbers”. 2009: Summer group show at the Terence Robert Gallery in Ottawa. 2009: Represented by the Terence Robert Gallery in Ottawa. 2009: Winter Group show at the Ian Tan Gallery in Vancouver. 2008: Artwork purchased for the Mitchell Press (Vancouver) collection. 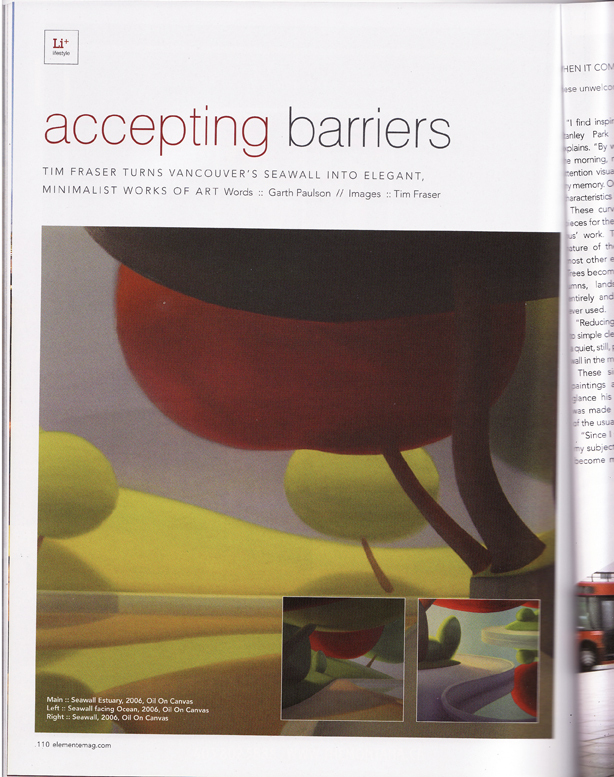 2008: Article in the September issue of Vancouver Lifestyles Magazine. 2008: Solo show #3 “City Park” (September) at the Ian Tan Gallery in Vancouver. 2008: Spring Group Show at the Ian Tan Gallery in Vancouver. 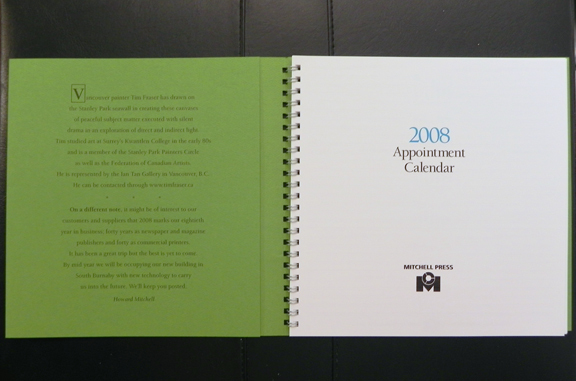 2007: Artwork chosen by Mitchell Press (Vancouver) for their 2008 Appointment calendar. 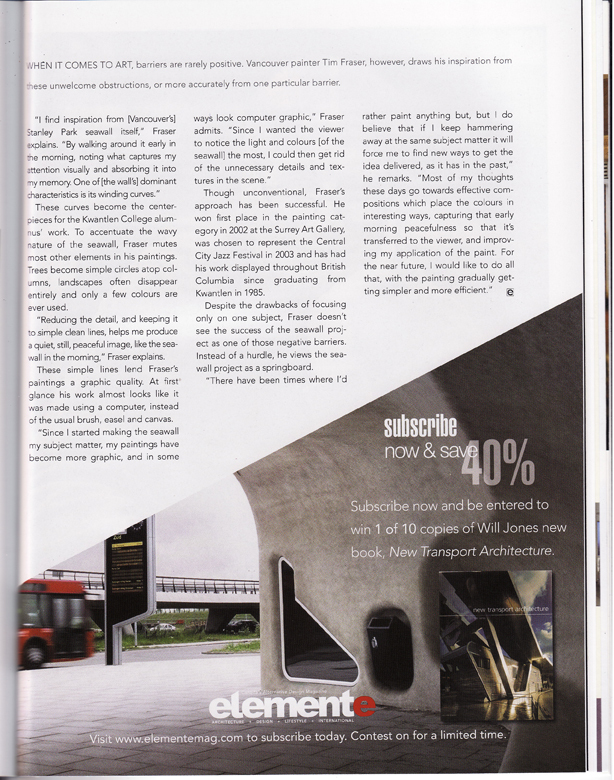 2007: Article in Galleries West magazine (Fall / Winter issue). 2007: Winter Group Show at the Ian Tan Gallery in Vancouver. 2007: Solo show #2 “Seawall Composed” (September) at the Ian Tan Gallery in Vancouver. 2007: Article in Elemente magazine (September issue). 2007: Spring Group Show at the Ian Tan Gallery in Vancouver. 2007: Article in the February 16 edition of The Province newspaper. 2007: Artwork proceeds donated to the Stanley Park Restoration Fund (February). of the Federation of Canadian Artists magazine "Art Avenue" (January / February issue). 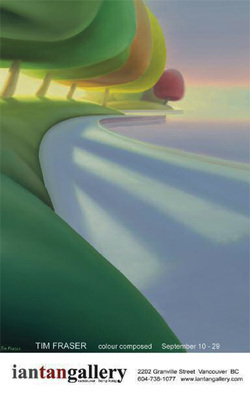 2006: Solo show #1 “Seawall in Colour” (September) at the Ian Tan Gallery in Vancouver. 2006: Group Show at the Elevation Gallery in Canmore, Alberta. 2006: Artwork contributed to the Stanley Theatre Art Auction, Vancouver. 2006: Group shows at the Ian Tan Gallery, Vancouver. 2005: Artwork contributed to the Stanley Theatre Art Auction, Vancouver. 2005: Group shows at the Ian Tan Gallery, Vancouver. 2005: Casa Publishing produces Limited Edition Prints. 2004: Group shows at the Gala Gallery, West Vancouver. 2003: Group shows at the Gala Gallery, West Vancouver. 2003: Group shows at the Kurbatoff Art Gallery, Vancouver. 2003: Artwork chosen to represent the Central City Jazz Festival, Surrey. 2003-2017: Member of the Federation of Canadian Artists, Vancouver. 2002: First Prize winner (Painting category), Arts 2002 juried show, Surrey Art Gallery, Surrey. 2002: Artwork purchased for the Linda Gainer collection, Fred Hutchinson Cancer Research Center, Seattle, U.S.A.
2002: Artwork contributed to Charity Silent Auction, Air Canada Championship P.G.A. Event, Surrey. 2001: Artwork purchased for the J.M. Leckie collection, CIBC Wood Gundy World Markets Inc., West Vancouver. 2001: Artwork contributed to Charity Silent Auction, Air Canada Championship P.G.A. Event, Surrey. 2000: Artwork purchased for the Lakes Straith Law office collection, North Vancouver. 2000: Artwork contributed to Charity Silent Auction, Air Canada Championship P.G.A. Event, Surrey. 2000: Artwork purchased for the collection of P.G.A golfer Cameron Beckman, San Antonio, Texas, U.S.A.
2000: Third prize winner, Fraser Downs Raceway Art Exhibition, Surrey. 1999: Artwork accepted for the Arts 99 juried show, Surrey Art Gallery, Surrey. 1999: Artwork contributed to Charity Silent Auction, Air Canada Championship P.G.A. Event, Surrey. 1999: Artwork purchased for the Mark Wilhelmi Law offices collection, Augusta, Georgia, U.S.A.
1998: Artwork contributed to Charity Silent Auction, Greater Vancouver Open, P.G.A. Event, Surrey. 1997: Artwork contributed to Charity Silent Auction, Greater Vancouver Open, P.G.A. Event, Surrey. 1996: Artwork contributed to Charity Silent Auction, Greater Vancouver Open, P.G.A. Event, Surrey. 1996: Third Prize winner, Hastings Park Racecourse Art Exhibition, Vancouver. 1996: Artwork accepted for the Arts 96 juried show, Surrey Art Gallery, Surrey. 1994-2004: Member of Stanley Park Painters Circle, Stanley Park, Vancouver. 1983-1985: Fine Arts Program, Kwantlen College, Surrey. 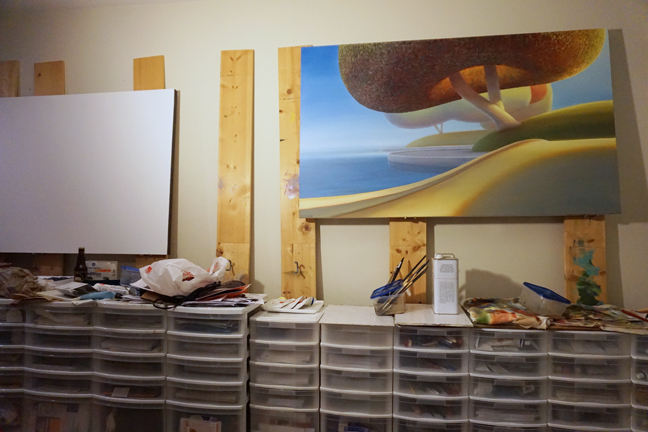 New painting drying in the studio. 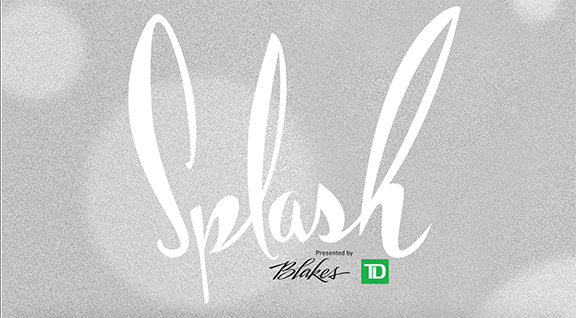 The annual SPLASH 2016 fundraiser to benefit Arts Umbrella held this year at the Fairmont Hotel Vancouver. Spring Group Show at the Ian Tan Gallery in Vancouver. "Seawall Puddles II" being auctioned at the annual SPLASH 2016 fundraiser to benefit Arts Umbrella. 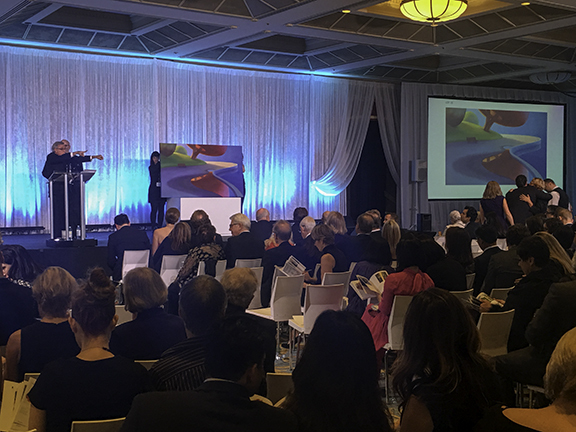 This year's event was held at the Fairmont Hotel Vancouver. 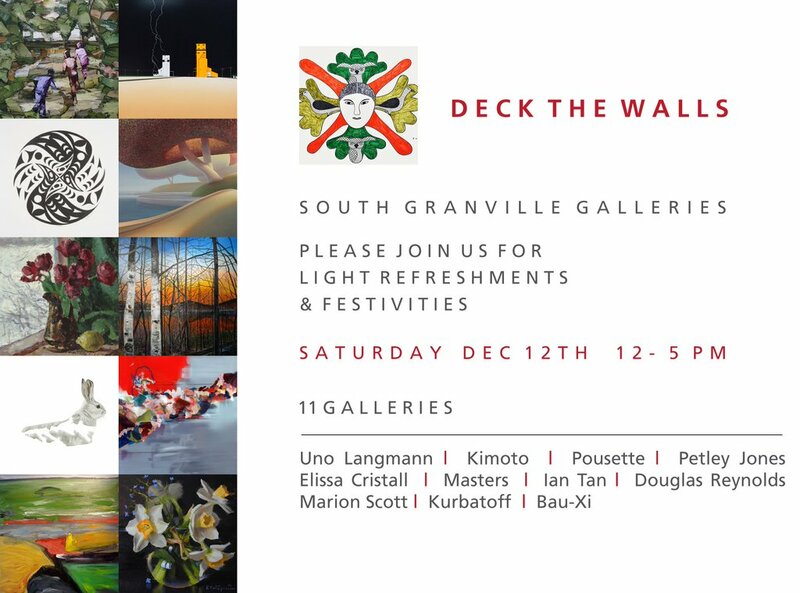 Deck the Walls group show in the Ian Tan Gallery at 2321 Granville Street, Vancouver, Canada. 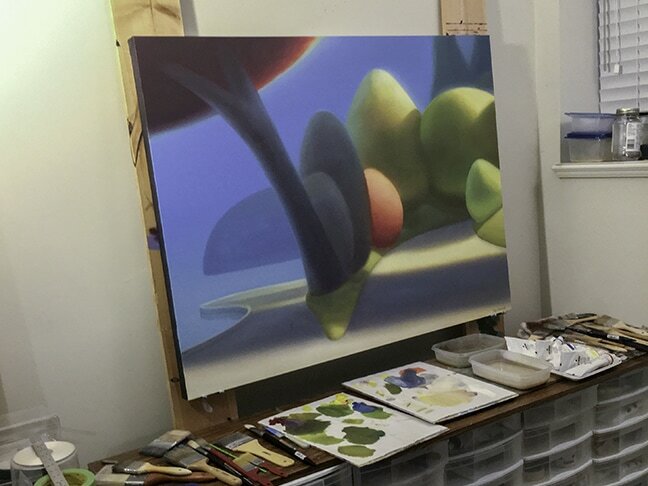 "Seawall Twins" (36" x 60" Oil on canvas) drying in my studio before heading off to the new Ian Tan Gallery at 2321 Granville Street, Vancouver, Canada. Final showing as part of a group exhibition in the Ian Tan Gallery before the gallery moves up one block and across the street to 2321 Granville Street, Vancouver, Canada. Curated the "Into the Mystic Art Exhibition" (March 3 - April 14) for Semiahmoo Arts in the Turnbull Gallery in South Surrey, Canada. Curated shows at Semiahmoo Arts in Centennial Park, White Rock, and at the Semiahmoo Arts Turnbull Gallery in South Surrey, Canada. Curated the 2014 "Expressions Festival" Exhibition for Surrey locations of Arts Umbrella in Surrey, Canada. Taught workshop "Suggesting Light with Paint" at Art Farm 2013 (August), to raise funds for the Fort Gallery in Fort Langley, Canada. 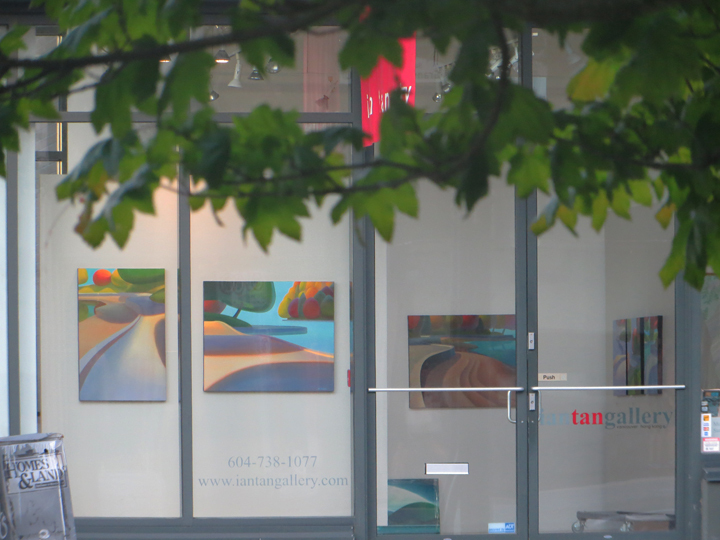 "Colour Play" show at the Ian Tan Gallery in Vancouver, July 6 - August 1, 2013. Ad in Preview magazine for the "Colour Play" show. Curated the "Expressions Festival" students show (June 8, 2013) for the Surrey locations of Arts Umbrella. Curated the "Auld Acquaintance" alumni show (Mar. 6 to 24, 2013) for past members of the Fort Gallery, at the Fort Gallery in Fort Langley. 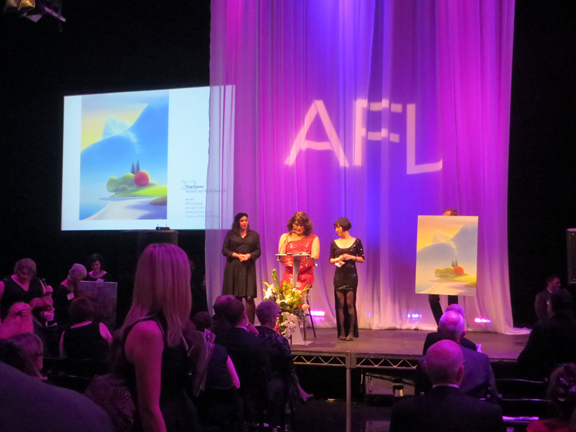 "Art for Life" fundraiser auction in Vancouver, Canada. New oil on canvas called "Seawall under bright sky" 2016, 40" x 60" available from the Ian Tan gallery at 2321 Granville Street, Vancouver, Canada. The painting as it hangs inside the new Ian Tan Gallery at 2321 Granville Street, Vancouver, Canada. Email invitation for the "Colour Play" show. Some panorama shots from the Summer group show, at the Ian Tan Gallery in Hong Kong, which runs from July 25 to August 22, 2012. Photos courtesy of the Facebook page for the Ian Tan Gallery in Hong Kong. Curated the "Auld Acquaintance" alumni show (Jan. 4 to 22, 2012) for past members of the Fort Gallery, at the Fort Gallery in Fort Langley. Page from the 2011 catalogue for the Federation of Canadian Artists annual fundraiser "Paintings, by Numbers". 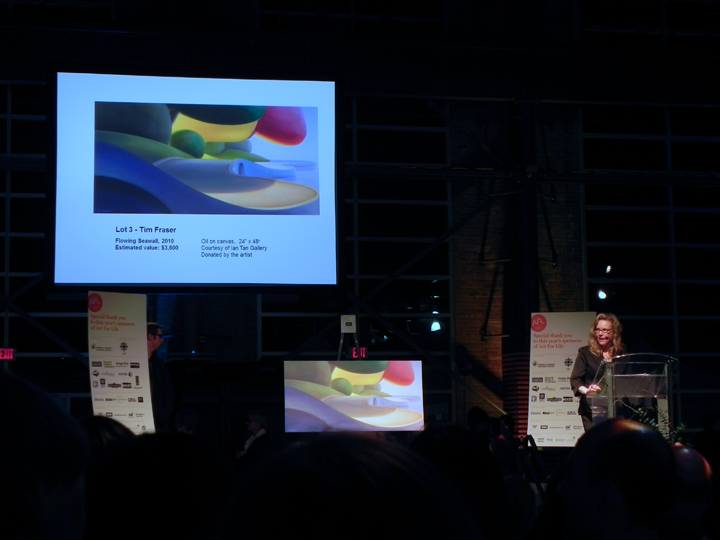 The Federation of Canadian Artists annual fundraiser "Paintings, by Numbers". Ad in Preview magazine for the "Colour Composed" show. "Colour Composed" show at the Ian Tan Gallery, in Vancouver. The 65 Red Roses mural installed in the lobby of the BC Children's Hospital in Vancouver, Canada. Here I join 4 of the other 64 artists who contributed to this mural, at the unveiling ceremony on May 11, 2011. Contributed a panel (top row, third from the right) to the Federation of Canadian Artist's "65 Red Roses" mural, to help raise funds for the Canadian Cystic Fibrosis Foundation. Please see 65 Red Roses for more information. The Edward Chapman Woman store at 10th and Granville in Vancouver, temporarily displays the 65 Red Roses mural. Page from the 2010 catalogue for the Federation of Canadian Artists annual fundraiser "Paintings, by Numbers". Ad in Preview magazine for the two-man show with Will Rafuse. Two man show at the Ian Tan Gallery with artist Will Rafuse, July 2010. Contributed a panel to Mural Mosaic's "Kunamokst" mural. Unveiled at the 2010 Vancouver Winter Olympics and permanently on display at the Galiano Inn on Galiano Island, B.C., Canada. Mural Mosaic's "Kunamokst" mural. Unveiled at the 2010 Vancouver Winter Olympics now permanently on display at the Galiano Inn on Galiano Island, B.C., Canada. 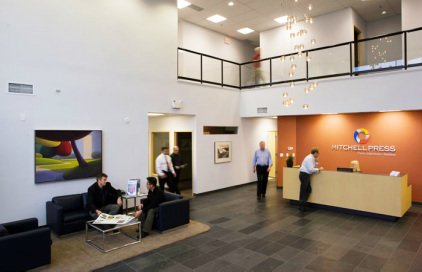 Represented in Ottawa, Canada, by the Terence Robert Gallery. 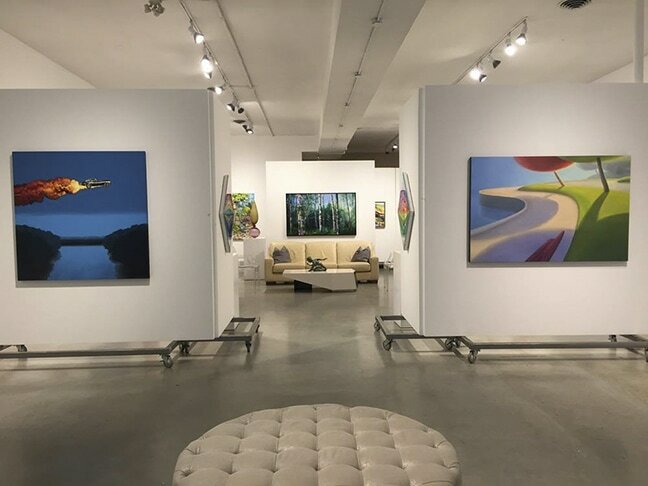 "Path into Colour" show at the Ian Tan Gallery in Vancouver, Canada. Ad in Preview magazine for the "Path into Colour" show. 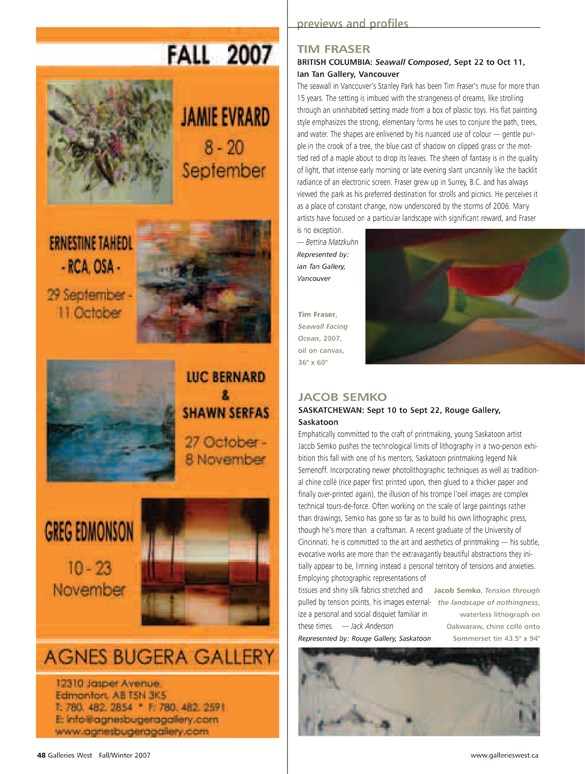 The gallery's email invitation to the "Path into Colour" show. Page from the 2009 catalogue for the Federation of Canadian Artists annual fundraiser "Paintings, by Numbers". 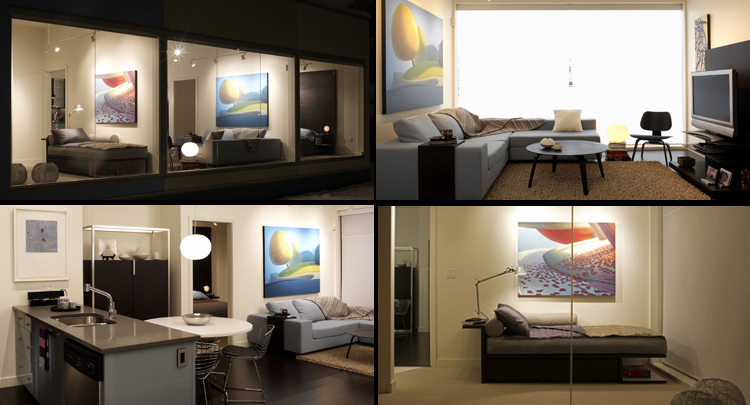 Penner & Associates used some seawall paintings in their show homes. Mitchell Press chose paintings from my 2007 show for their 2008 Appointment Calendar. December 2008. The Ian Tan gallery and I are listed on the plaque erected in Vancouver's Stanley Park, at Prospect Point, thanking those who contributed to the parks restoration after a 2006 storm had destroyed sections of the park. The park has been a great source of inspiration for me, so the Ian Tan gallery and I raised funds by auctioning off one of my seawall paintings. December 2008. The plaques (on the right) overlooking Burrard Inlet in Vancouver's Stanley Park, at Prospect Point, thanking those who contributed to the parks restoration after a 2006 storm had destroyed sections of the park. The park has been a great source of inspiration for me, so the Ian Tan gallery and I raised funds by auctioning off one of my seawall paintings. Article in the Sept. issue of Lifestyles magazine. 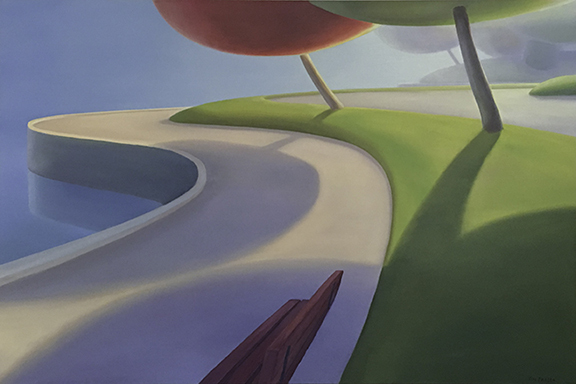 "City Park" show at The Ian Tan Gallery in Vancouver, Canada. The gallery's email invitation to the "City Park" show. Ad in Preview magazine for the "City Park" show. "Seawall Composed" show at The Ian Tan Gallery in Vancouver, Canada. Ad in Preview magazine for the "Seawall Composed" show. 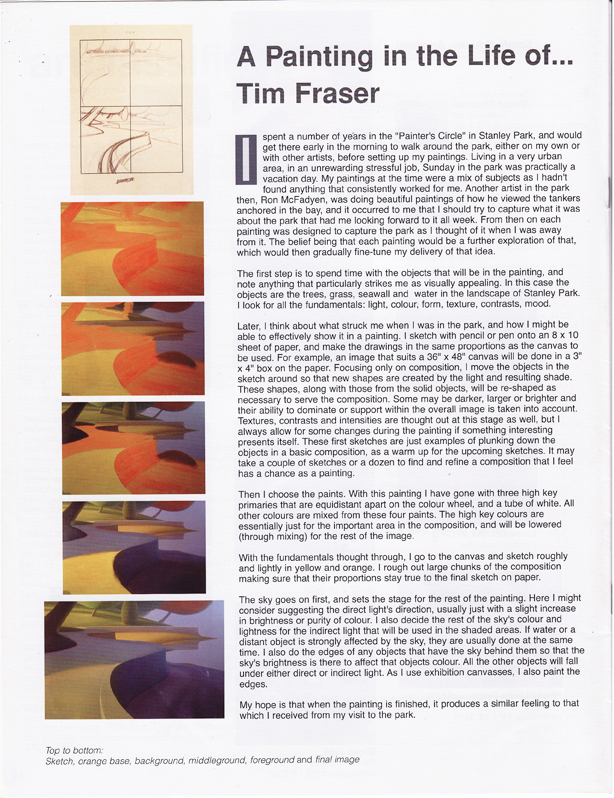 Preview of the "Seawall Composed" show in the 2007 Fall issue of Galleries West magazine. Article in the Sept. issue of Elemente magazine. 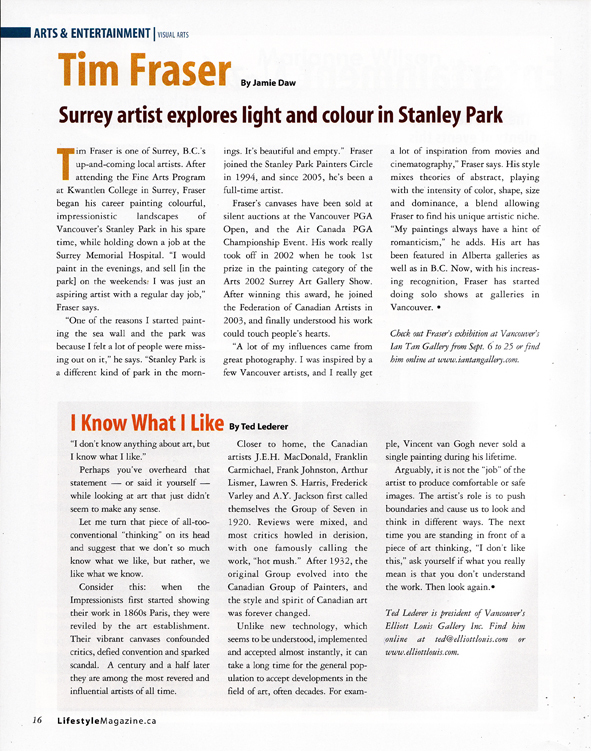 Contributed an article for the Federation of Canadian Artists magazine "Art Avenue" (January/February issue). Ad in the Globe and Mail for the first solo show "Seawall in Colour". Solo show #1, Sept. 2006. 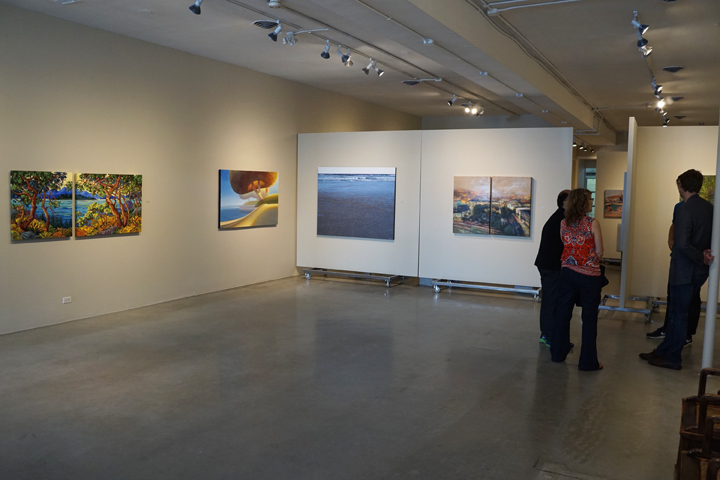 "Seawall in Colour" show at the Ian Tan gallery in Vancouver, B.C., Canada. Ad in Preview magazine for the "Seawall in Colour" show. Started being represented by the Ian Tan gallery. 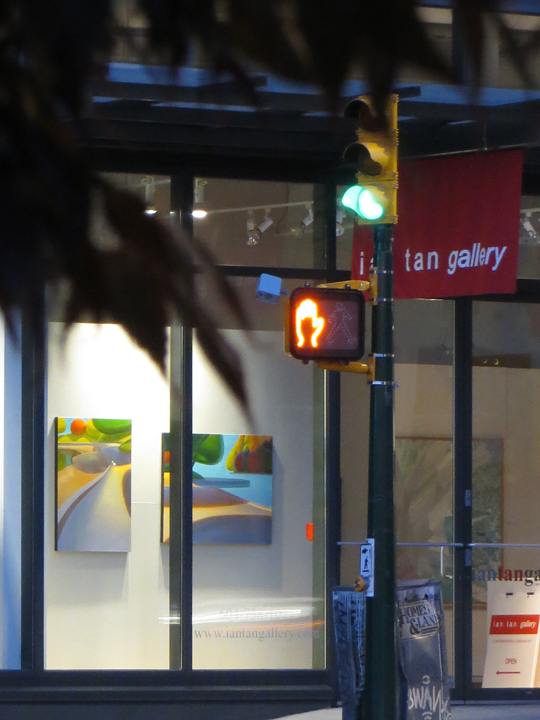 "Seawall at High Tide" painting in the window of the Ian Tan Gallery at 6th avenue and Granville street in Vancouver, Canada. "Seawall Passage" painting in the lobby of the Stanley Theatre at 12th and Granville street in Vancouver, Canada. The cake below was for the "Opening Night" performance of the musical "Miss Saigon". "Seawall Passage" painting in the lobby of the Stanley Theatre at 12th avenue and Granville street in Vancouver, Canada, as part of the Stanley Theatre Art Auction. Article in the program for the musical, Miss Saigon, at the Stanley Theatre in Vancouver. Street Banners on King George Highway in Surrey for the Central City Jazz and Blues Festival. Display at the Central City Shopping Centre, Surrey, B.C., Canada, announcing the coming Central City Jazz and Blues Festival. 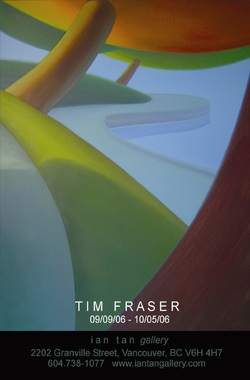 Cover of the Surrey Art Gallery's Arts 2002 juried exhibition of local art. Placing first in the painting on canvas category of the Surrey Art Gallery's Arts 2002 juried exhibition of local art. 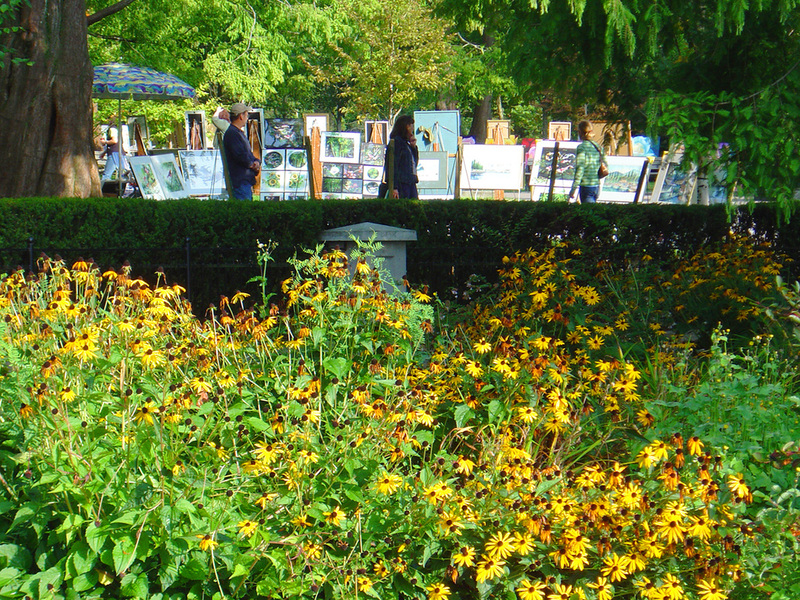 Weekends in Vancouver's Stanley Park as a member of the Painter's Circle.